I found a recipe for Chicken with Cream Cheese Sauce on allrecipes about a year ago. I made it a few times, changed it up a bit, and we both really enjoy it. Tonight I was looking to do something like it, but spicier. This was inspired by my trip to the Mexican market where I picked up a few jalapenos and a dried poblano (next time I'll be picking up more spices - they had so many neat things there!). Cook chicken about halfway in a pan with olive oil. Add garlic, red pepper flakes, chili powder, peppers (including all seeds), and broth. 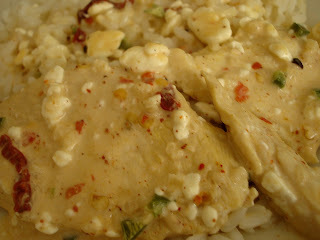 Cover, reduce heat to low, and simmer about 10 min (longer for thicker chicken breasts) until chicken is cooked through. Remove chicken to a covered dish and set aside. Add the softened cream cheese to the broth. Whisk while on high heat until all lumps are gone. Turn heat to low and let it simmer for a few minutes. Pour most of the sauce over the chicken. The rest of the sauce is great over rice!! It was good, but we love spicy things and could have taken it a little spicier. This one goes on the "make again" list. I like your spicy twist on CCC. BTW, I made this last night. It rocked. Thanks!